What to do with Revilgaz’s Cutlass.. Since I saw someone in Stormwind wearing this amazing shiny sword, I decided that I needed to have it, even though it’s not really of any use on my mage (but I’m pretty sure I’ll go through the effort to get it on other characters, too!). 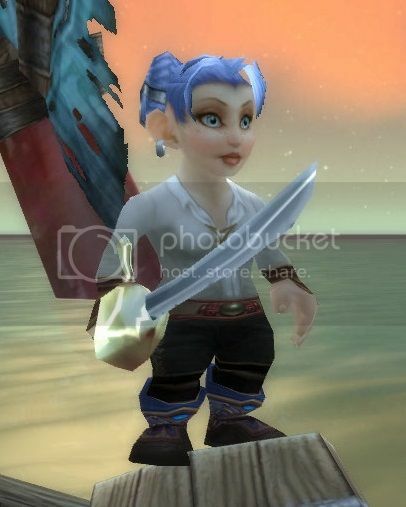 Now I only need to find a good matching set that works well with it, which means either a Pirate or Stormwind Army Sailor themed one.. and I don’t want to simply go for the Buccaneer’s Look, which is nice enough and better than nothing, but I would like to have something more unusual and maybe complicated. A good start could be the Admiral’s Hat or the First Mate Hat.. Hmmm. This entry was posted on Tuesday, August 6th, 2013 at 09:43	and tagged with Cutlass, Pirate, Transmogrification, world of warcraft, WoW and posted in Armor Sets, Stuff, World of Warcraft. You can follow any responses to this entry through the RSS 2.0 feed.